Many people have been asking for an official android port for a while. The last time we tried (well mostly mniip did that), it didn't work so well. I've worked out some of the issues by using a different version of SDL though, redesigned some of the interface to be touch friendly, and now it works perfectly! I've had it on my phone the last few weeks. Making saves is a bit harder due to loss of precise control (you can easily place a zoom window though), but it is very easy to comment on and open saves, and just about everything works. Definitely test and report bugs, missing (unusable) features, or any other feedback. It is based off of my mod so there is a feedback reporting icon too. Some features can't be used, like lines, boxes, flood fill, stickmen, or any keyboard shortcuts requiring ctrl or shift. 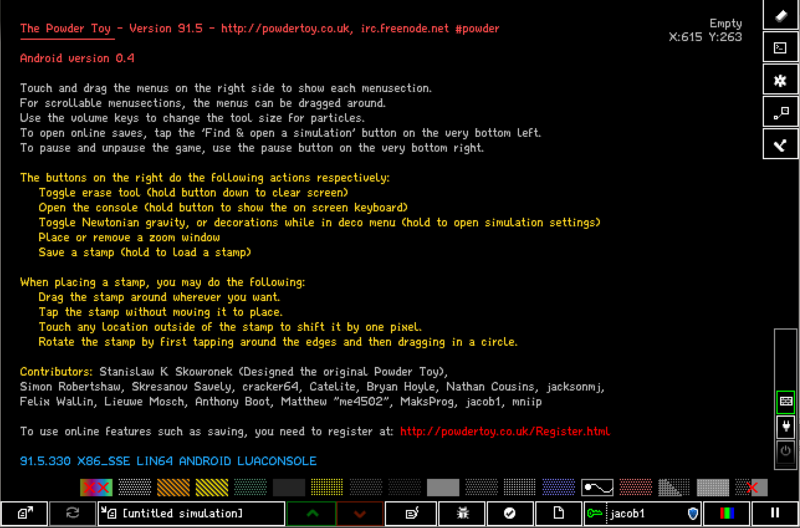 Android compiling instructions can be found inside the COMPILING file. Google Nexus 6 on Android 5.1 confirmed working, and quite well at that. Controls could be a bit bigger though, or at least have an option for changing the GUI size. The Nexus 6 is similar in many ways to the Motorola X, so I'm not surprised it performed well on it given that it did so on an X. This has a lot of potential for a future project development. I should really look into this for experimental purpose project. All we need now is an ios version and a touchscreen mode for computer. I can compile a touchscreen one in a bit, I tested it all on my computer. Although I still used a mouse because my touchscreen has issues with TPT (due to a program I have on here). It would definitely have to be a separate compile and not an option. The touchscreen one is 14 pixels wider and has a bunch of other changes. I have a Microsoft Surface Pro 3 which is pretty much a PC as it runs Windows on an x86-64 CPU, which I could use to test that out and give feedback if needed. It worked in my Moto G, 30 fps. Thank you very much. The buttons, however, are a big problem: some of them cannot be pressed accurately. Saving to local disk is also hard, as names cannot be typed. How to toggle deco? Nice port, although I might need some time to get used to the controlls. Works on an HTC One M8. Sometimes the buttons for saving, etc are a bit off though. ( Well.. it could just be my inaccuracy with my fingers ), constant 60 fps.